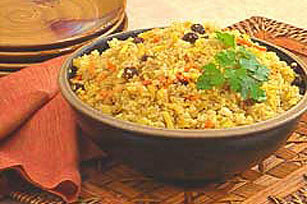 Experiment with our Curried Quinoa Pilaf for a dish as easy as curried rice. Our Curried Quinoa Pilaf has a built-in bonus of nutty, earthy quinoa flavor. Melt butter in large saucepan on medium-high heat. Add onion; cook and stir 4 minutes or until onion is tender. Add broth, quinoa, raisins and curry powder; stir. Bring to boil. Reduce heat to medium-low; simmer 20 minutes or until broth is absorbed. Stir in carrots and almonds; cover. Let stand 5 minutes before serving. Toasting adds a deeper flavor and crunchier texture to quinoa. After rinsing quinoa, drain well. Heat a large nonstick skillet on medium-high heat. Add drained quinoa. Cook until quinoa dries out and becomes golden brown, stirring frequently. Remove from heat. Transfer to bowl and continue as directed. Cover and refrigerate any leftovers up to 4 days.